San Manuel is a tribal casino that’s located in Highland, California, in about an hour drive from LA. At first, the place was opened as a high-limit bingo salon for the locals before it was rebranded into San Manuel Indian Bingo and Casino and expanded to accommodate other forms of gambling. As the name implies, the casino is owned by the local San Manuel Band of Mission Indians who are the key employer to over 3,000 people in the area through the casino and its various amenities. It’s a fairly large gaming and travel center that comes with a number of private playing areas. The San Manuel casino is a decent looking modern gaming area with 300,000 square feet of gambling space – a large portion of which is reserved for table games. There are over 100 table games available at the casino, including Blackjack, Pai Gow, Texas Hold’Em, Roulette, Craps, and Blackjack, as well as a dedicated Poker room. And just like the name suggests, there’s also a large bingo hall at the casino. San Manuel doesn’t really leave you spoiled for choice, as it offers only two Blackjack variants, despite having three separate gaming areas. The main pit holds mostly low limit games along with a few higher limit ones, and there’s also an Asian-themed gaming room called The Lotus 8 Palace, where you can find the same games as in the main pit. And if you’re looking for high-stake play, you can hit the high-limit salon. 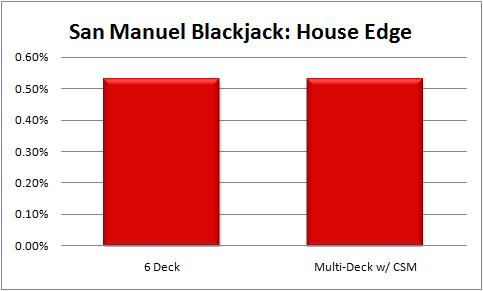 Nearly half of the Blackjack offer at San Manuel is 5 deck games with Continuous Shuffling Machines, with even the high-roller pit offering one. From a card counter’s perspective, this is the main reason why the casino isn’t recommended for a special trip but more like a quick stop along the way. The only thing good about these tables is that they have $5 minimums, with some going up to $10, while the maximum is capped at $2,000. These are all “dealer hits on soft 17” tables, were doubling after splitting and doubling on any two cards is allowed. Late surrender is also offered at some tables, but you can’t re-split aces. The house edge at the CSM games is approximately 0.52%. The rest of Blackjack games at San Manuel are shoe games with 6 decks and minimums from $5 to $50 in the main pit, while the max bet is $2,000. The high-roller pit, on the other hand, offers the same games but with higher minimum stakes that range from $50-200. All shoe games have the same rules, i.e. dealer hits on Soft 17, you can double on any two cards and after you split, re-split aces only once, and there’s also late surrender at some tables. The penetration is mostly up to 60%, but some dealers make exceptions if you tip, while the house edge is approximately 0.54%. Counting at San Manuel will have you switch between tables and sit out a negative count every once in a while. The penetration is good if you find the right dealer, so you might want to scout a bit before you hit a game. Betting up to $100 here doesn’t draw much heat if you play at the higher-limit tables, but hitting such bets on a $5 minimum game will sound the alarm. So, switch up tables, keep it steady and don’t try to outsmart the casino. San Manuel has mostly remained a popular stop due to its convenient location, rather than the quality of its Blackjack offer. While Poker players might find more variety here, when it comes to advantage Blackjack the only real choice you have is the 6 deck games, where the penetration isn’t consistent enough to make it worth your trip. The only thing that mostly sells this place is the dedicated gaming areas and the fact that it’s a much better looking place than other Native-American casinos, but that isn’t really much to begin with. San Manuel will require some table hopping to be effective when counting cards. If you sit through every negative count, they’ll eat you up pretty quickly. If you’re willing to move around you should be fine.